With income inequality in the United States at record high levels, employee ownership is increasingly being lauded as a potential solution to spreading wealth more broadly. Most recently, research from the National Center for Employee Ownership released in May shows that employee owners have a household net worth that is 92 percent higher than non-employee owners. They also make 33 percent higher wages, and are far less likely to be laid off. But employee ownership requires new investment in order to get to scale. 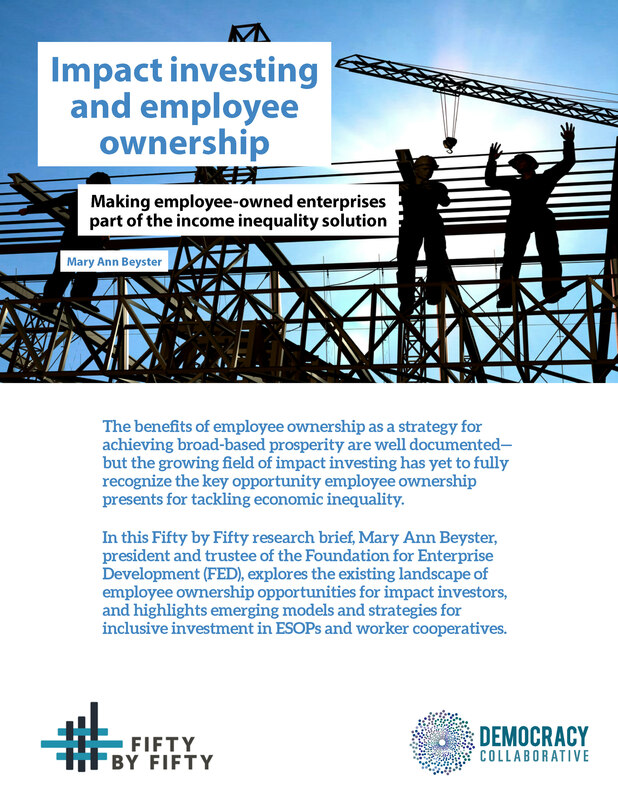 A new report by Mary Ann Beyster, president and trustee of the Foundation for Enterprise Development (FED), published by the Fifty by Fifty initiative of The Democracy Collaborative, examines the investing landscape for potential opportunities in employee ownership. The report, Impact Investing and Employee Ownership, reports on the results from six months of research showing that the opportunities for impact investors to support employee ownership are limited, but that an investing infrastructure is beginning to emerge across asset classes.